On February 26, Beijing announced the first license-plate lottery results for 2014. On the same day, the municipal government also released the list of new-energy car models subject to consumer subsidy. BYD's all-electric E6 model and BAIC Motor's E150EV have become the first two models on the list. That day, 1,428 applicants were picked as eligible to buy new energy cars. Starting from 2011, the city introduced a license-plate lottery system designed to limit the number of privately owned cars hitting the road each year. According to an announcement by the Beijing Municipal Government, in the future, more new-energy car models will be added to the list of government-subsidized cars available to consumers. Previously in Beijing, new-energy vehicles were mainly buses, taxis and sanitation trucks, and the number of new-energy cars was very small. A steep rise in users of new-energy cars in Beijing may indicate that China's new-energy vehicle market is embracing opportunities for development. According to figures from the China Association of Automobile Manufacturers (CAAM), at present in China, there are more than 30 manufacturers of new-energy vehicles, including both Chinese brands such as BYD, BAIC and JAC as well as joint stock companies of General Motors and Toyota. The Planning for the Development of the Energy-Saving and New-Energy Automobile Industry (2012-20), which was released by the Central Government, sets a target of producing and selling 500,000 pure electric and plug-in hybrid vehicles by 2015, and 5 million vehicles by 2020. It's clear that China is unlikely to reach the goal of producing and selling 500,000 electric vehicles by 2015. However, it is estimated that more than 10,000 Beijing residents will buy new-energy private cars this year. 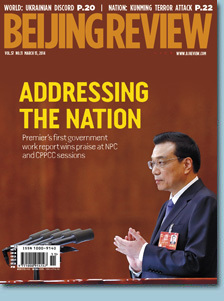 If Beijing can reach this goal, the Chinese new-energy vehicle market will grow rapidly. Ye Shengji, Deputy Secretary General of the CAAM, said China's low capacity in producing and selling new-energy vehicles can be mainly attributed to an inadequate number of buyers. In order to encourage development of the new-energy vehicle market, the Chinese Government has slowed down the reduction of subsidies to new-energy vehicle buyers. 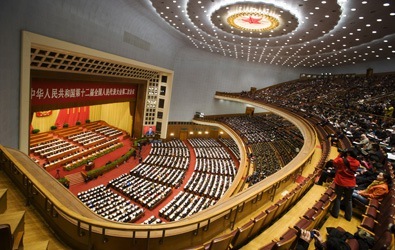 According to a document jointly released by the Ministry of Finance, Ministry of Science and Technology, Ministry of Industry and Information Technology and National Development and Reform Commission at the beginning of 2014, the subsidies for new-energy vehicles in 2014 will be 5 percent lower than those in 2013, and the subsidies in 2015 will be 10 percent lower than those in 2013, which represents half of the previously planned reduction. The document also states that after the present subsidy policy ends at the end of 2015, the Central Government will continue offering subsidies. Ye said that the sales volume of new-energy vehicles in China is likely to grow explosively this year. While the government is promoting the saving of energy, the reduction of emissions and stricter controls on air pollution, China's new-energy vehicle industry will surely avail of the opportunities this situation presents. Compared with gas stations for fuel-burning cars, which are available everywhere, an inadequate number of charging poles stand as the major factor restricting the development of the electric vehicle market. China has been promoting the development of electric cars and made it one of its measures to reduce pollution, but because of the difficulty facing building charging poles, the government's efforts have, unfortunately, had little effect. To redress this situation, Beijing decided to engage in rapid full-scale construction of charging poles this year for the first time. It plans to finish construction of 1,000 public fast-charging poles within the year, and in the future there will be a charging pole every 5 square km, with a public charging facility network to be built. At present, there are only 20 charging stations in Beijing. 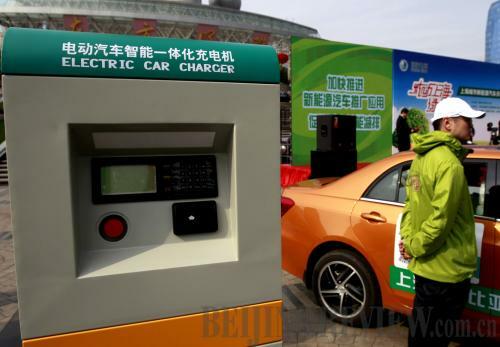 Xu Xinchao, chief of the New Energy and New Materials Division of the Beijing Municipal Science and Technology Commission, said in order to encourage use of new-energy vehicles, the government now only charges electricity expenses for the users of public fast-charging poles. To run for 100 km, new-energy cars need 15-18 kilowatt-hours (kWh) of electricity. With electricity price of 0.81 yuan ($0.13) per kWh, the cost will be 12-14 yuan ($1.96-2.29), which is a tempting price for car users.